In the first Car Detailing article, I outlined my most used tips on detailing your car and keeping it clean through all four seasons. As this article focuses on Waxing and Clay bar use, waxing is a good preventative measure that should be done maybe once every month or every other month, just to keep the paint smooth (depending on how much your car sits out uncovered). Clay bars are used when the paint feels rough and has contaminants such as tree sap. Leave a comment below for any detailing questions you may have after reading this article. Look for future detailing articles on bucket washing and even car show prep. For now, let’s get into making your cars paint smooth! 1. Water stops beading up on the paint after a rainstorm or if you’ve hosed it off. Beading up water means your cars paint has enough wax on it to keep the water from running off. 2. If you can hear your paint as you run your finger on it. Sounds strange I know, but if you run your finger along the paint (after it is cleaned to prevent rubbing dirt into it) and you can hear a sort of metal or rough sound, it’s time for some wax. 3. Your paint may look clean, but not only the sound of it can be an easy way to tell, but also the feel. If you run your finger along the paint and it doesn’t feel like glass then it’s also time for some wax. 4. The way it looks is probably the most obvious of the bunch. You’re paint should look like a mirror. It should look like or almost look as if it should ripple if you touch it. Sometimes paint may be too far-gone for this, but hopefully you’re reading this before it’s too late! 5. After waxing has been completed the way you can tell if the paint needs to be clayed is if it still feels rough, you can still hear the paint, or if it still lacks that mirror like shine. I will get into the specifics next. After you have followed the steps in my first Car Detailing 101 article, then you can see if your car needs wax. If your car sits out on a regular basis, or if you park under trees often, you probably do need it. Make sure the car is cool to the touch and in a shaded area for waxing. Hot paint or the hot sun is the worst way to wax a car. After starting off with a clean car, get your favorite brand of liquid wax (I use Meguiar’s) and a clean wax applicator free of contaminants. Put a small amount in the middle of the pad then fold the pad in half to get the wax evenly on the pad. Then take a pad (unfolded of course) and move it around the paint in a circular motion applying a thin layer to the paint. You may want to start off with just a small section of the car that feels rough and wax that. If after removing the wax it still feels rough then you can move on to the clay bar in step 3. But if you’re car is pretty smooth and is covered often with a car cover or the garage waxing may be all you need. In that case, you’ll need to add wax to the pad often to get all the cars paint covered. If your car has paint that continues into the inside of the car, don’t forget to wax that too. The point at which you know you’re done waxing is when the paint has a sort of foggy look. If you look obliquely down the side of the car and you see glossy parts, then you know you need to apply wax to those places. Once the areas you need to wax (or the entire car) are covered (only paint) with wax, take a clean and soft microfiber towel and remove the wax front to back (side to side) until the paint looks shiny. Again, look obliquely down the sides and across the car to make sure you’ve gotten all the wax off. Make sure, if you wax over logos or badges on the car that you are careful to remove wax on and around those. Don’t get the towel stuck in the edges of the logos and just take an extra couple of minutes to get the excess off. Keep turning the towel often to a clean part to avoid possibly rubbing something into the paint. At this point your paint should feel smooth and look more like clear glass rather than frosted glass. If you live in a humid environment you may notice the paint may look blotchy after the wax is removed. In an instance like this you may need to go over the paint with Quick Detail after. But if you’re paint still feels rough after waxing then you know it’s time to take out the clay bar. Starting off, make sure you have a bottle of something like Quick Detail from Meguiar’s to use as a lubricant for the clay bar. This is very important and should never be skipped. 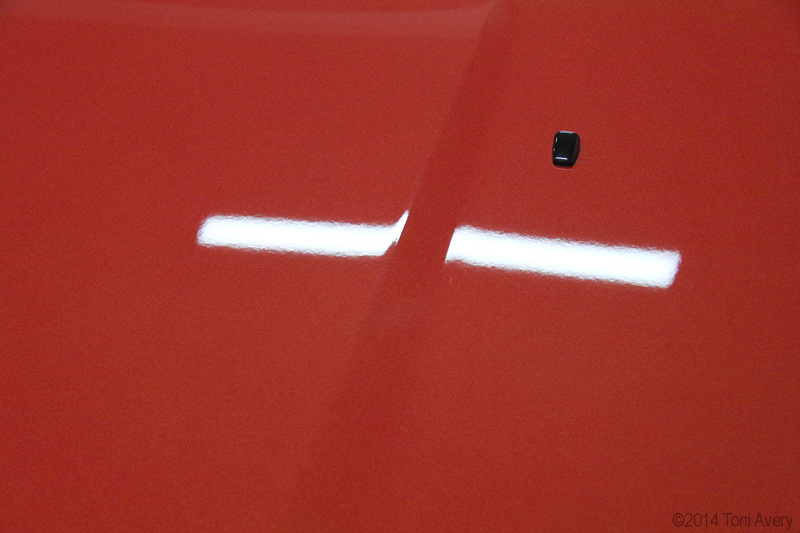 Start small with just a portion of the paint, say half the hood, part of the fender or half the roof. Starting small will prevent the Quick Detail from drying up before you can use the clay bar. Be sure you clay in a covered or shaded area, like in the garage or under a tree (non-sappy of course). After the particular area is sprayed with Quick Detail, take the clay bar and rub the paint in back and forth (side to side) motion. Once you have rubbed in the clay bar, dry the area with a microfiber. After the entire car is done, or whatever area needs it, you’ll have to wax those areas again. What the clay bar does is it removes any wax or protectant you have on the paint. But it also gets all the contaminants off too. So be sure and wax wherever you clayed. If your paint still feels and sounds rough or just doesn’t look glassy, you may need a more professional job for your paint. Meguiar’s sells buffing and polishing kits, but you may want to hire someone and observe if it is your first time. Remember, these steps don’t apply to those with paint that has completely peeled off and if you have a car finished in matte paint, you may want to consult with the dealer or the handbook on the car for maintenance. This is more for those who can still save their paint. Have further questions or have done all of the above and still don’t have the results you want? Comment below! I’m a car lover too, and I’ve gotta say this is a great guide for waxing your car. We’ve created a handy little infographic on top tips for waxing your car over at our site (it’s under the How-To page), I’d appreciate it if you took a look, and even considered sharing it. It’s only early days for us, but we’re hoping to be able to share lots of great info with car enthusiasts! Sorry for taking so long to get back to you. If you click my username it’ll take you there (it’s greatopenroad.com).